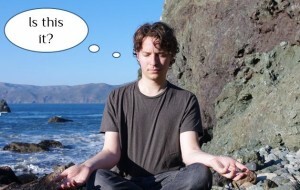 How to Meditate... It Can be Done! How to Meditate… It’s doable though might frustrate you a bit. The true spiritual approach to meditation starts with an attitude of compassion. How so? Until one learns how to meditate, life can seem quite rough. The mind is not a relaxing place when we never take deliberate time to stop and ‘check in’. In so doing, you may feel like there is so much mental activity that getting to even a fraction of stillness will never happen. But that is absolutely untrue. There are many activities that can be called meditative. A friend of mine said he was painting his living room and in particular, a banister. The amount of focus required to do a good job meant intense concentration and for 12 hours he labored. But he said his mind didn’t drift into typical stressful areas around work or family challenges. For him, that was a form of meditation. Nothing wrong with that of course. But let’s talk about actual sitting down to meditate. When there is no activity available to capture your attention, that lack of stimulation can be quite a challenge. The mind longs for something to focus on. I’ve heard it said that we shouldn’t fault the mind. It’s just looking for something more interesting to get engaged with. Your mind might be heard to utter, “Why do we need to know how to meditate! There’s so much else we need to focus on!” When you purposely try and get still, it stirs up all sorts of garbage to fill that void. If you never make an ally of your mind and learn to discipline it, it tends to take you on a wild ride. Meditation, if practiced consistently will soothe that very issue by you befriending the mind and steering its focus where you want it to be and not wherever the heck it pleases. You’ll see a lot of the teaching online about focusing on breath and moving to a place of stillness. Great stuff but try this. Sit down somewhere, close your eyes and pay attention to your thoughts. Just notice what is on your mind for a few minutes and try not to get irritated even if your thoughts are all over the place, redundant and speedy. Notice one particular thought and examine it. Begin the process of learning how to discern thoughts and what they are trying to communicate. The mind is not the source of intelligence but the vehicle for intelligence to come through. So start dethroning your mind as this all powerful entity. It needs direction and it needs to be managed. Maybe even micro-managed. If you don’t like a particular thought, learn to literally terminate it. Other thoughts that seem redundant may mean your mind is looking for a resolution. So practice making a decision. And if a decision doesn’t solve the particular looping thought, then cut it off. Learn to stop a thought that is looping and leading to anxiety. You literally have to decide to empower yourself and stop that thought! This practice of observing your mind and discerning the activity will begin a whole new approach to life. It’s a good start to meditation actually. Looking to Learn How to Meditate in Charleston? Click Here.